We all know how to make a corset, right? Take a bodice pattern that’s too small, sew a lot of boning channels in it, a little jiggery-pokery to get the boning in, seal the edges, and presto change-o, corset. And that’s great, but it’s not the only way to make a corset. Well, ok, if you want to get all technical, then that is the only way to make a corset, but it’s not the only way to make a pair of stiffened bodies capable of supporting the body and forming it onto a conical shape. Here’s another method that relies on stiff sheets of interlining, rather than multiple thin bones. Using fabrics that have been treated with glue or paste sizing to give them stiffness is a very old construction technique. It’s largely out of fashion in today’s styles (oh, spandex, you cheeky little monkey), but it’s still used in millinery, upholstery, drapery, shoe making, and book-binding. We’re talking about buckram and pasteboard. This is a period means of stiffening a bodice. In Corsets and Crinolines, Waugh mentions that corsets weren’t stiffened with whalebone until the second half of the sixteenth century. The earliest of corsets were cut from layers of linen, possibly treated with paste to give them extra stiffness. (Waigh, 19) This would seem to be the case in both England and France. Fontanel writes, “The basquine, which derived from the midieval cottes and surcots, consisted of a tight-fitting sleeveless bodice worn over a shirt and laced at the back. To stiffen it, the basquine was lined with prepared cloth, and even reinforced with brass wire. 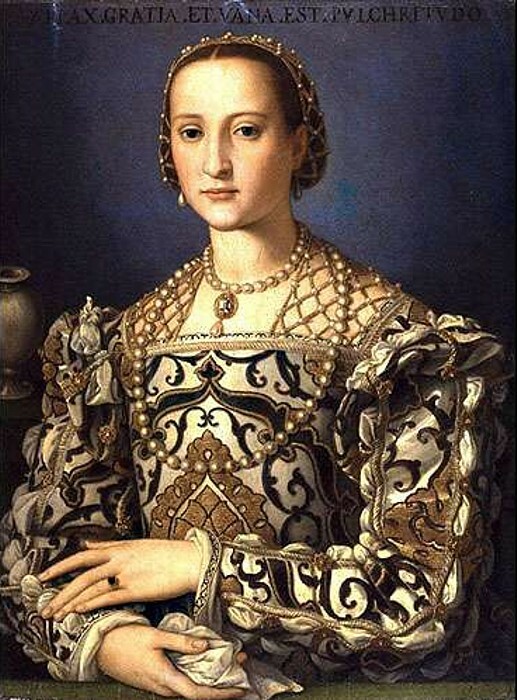 Here, too, some historians of dress have seen an ancestor to the corset.” (Fontanel, 25-26) Anea has a marvelous article that covers the use of glue stiffened interlinings in italian dress in the sixteenth century. The fabric on the bodice is as tight as a drum. There are no stress wrinkles, no sagging, nothing, and by all rights, there should be stress wrinkles. I mean, to get fabric to stay that tight to an interlining, you practically have to laminate them together. So we’re going to, using an ancient millinery secret. I use this trick for hat brims that I know I'm going to curve. I can bend this thing any old way, and the fabric stays tight to the buckram interlining. The secret for doing this is so well-guarded that my millinery teacher never mentioned it. I found it inside an old hat that I was either repairing or mangling for a theater (it’s hard to know). It’s one of my best tricks. How will you stitch through the glue when you do the eyelets? If this were for a non-doll sized corset, what type of hand stitch would you use to hold the side pieces together? I’ve worked with hot glue when sewing items on for bellydance costuming and there’s NO getting thru it with any kind of needle. Would the cement glue leave the needle sticky? Just curious! I will definitely use this next time when making a French Hood or Gable. Teehee…. Since the cement seals the fabric from the backside, it prevents fraying. Instead of using the thread tension of an eyelet stitch to hold a hole open, I plan to use a small punch tool. Normally I hate severing the threads of the fabric, but these are pretty well sized. (Since she’s a doll, I’m thinking about doing something saucy with fabric paint instead of stitching. I didn’t like the size I was able to get for the eyelets on the 11th century schmata.) For a human size, you could punch the hole then add a grommet, or overedge with a buttonhole stitch. It might technically be possible to spread the threads with an eyelet, but I think it would be quite the fight. The cement definitely does change the sewing – go slower on a machine, and be prepared to bust out pliers to handsew. *shrug* It’s no different than sewing through any other sized fabric – there’s more drag on the needle. Be prepared for the needle to dull faster. This is much less of a bother than sewing through those fabrics with the glued-on metallic “sequin” dots. Ugh. Those destroy needles! If you were doing this on a human sized bodice, I’d recommend only using the cement around the outside 1-2″ of the pieces just to get the layers together smoothly – that ought to be enough to avoid stress wrinkles near seams. Also, I don’t use buckram, because it’s too easily deformed by moisture. I’d use pet-resistant window screening (yes, really, I have), plastic canvas (I confess to this too), or many layers of heavy net stacked and quilted together (possibly my most legit cheat). The window screening is really good for a dramatic Malifocent style collar. A touch of cement keeps the line smooth. Ok, I always knew you were a genius, Missa… But this just proves it. In fact, I was sitting here thinking about paste stiffened interlinings in Florentine clothing for the last several days and contemplating whether or not I should break out the Elmer’s and have a go at it myself. Also, what does it say about me that I only found out you were blogging again (and apparently have been for ages) from Jen, who posted on LJ saying that she felt bad that she had no idea I was blogging again, too. LOL. This is absolutely amazing!! I do mostly lower class Elizabethan and I really think this would be perfect for a “cheaper” pair of bodies. I also think this would speed up the tedious process of corset construction exponentially! Would you mind if I tried this as a human size experiment? Christina – go wild! :) I’d love to know how it works for you! 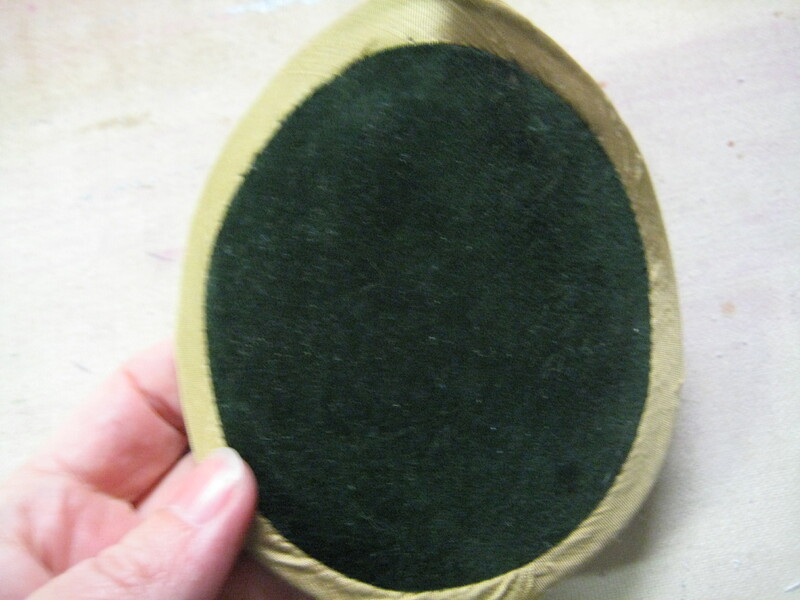 Oh, don’t use normal buckram – it’s designed to go all floppy when wet, so if you sweat in it, it’s a loss. Heavy interfacings, plastic canvas, plastic window screening, etc will be a better plan. Sarah – SARAH! Yay! Thanks, hon. :) It says the same thing about you that it says about me – I really need to go check what you’ve been doing on http://www.modehistorique.com/ . Was that a shameless plug? I’m sure that wasn’t any sort of shameless plug. Teehee! This makes sense to me, especially when applied to medieval fitted gowns. I do not think there is any form of “boning” in those at all, yet, there is *something* that makes them fit really closely AND moulds the body to the right shape. I am also utterly convinced they are supporting the bust (I’m talking 15th century here – not earlier). Having said that, when I made my last medieval Queen Gown, I had issues in keeping the middle (under the bust) nice and smooth with only wrinkles at the waist where one would expect them to be. Boning would have resolved it but I didn’t want to do that. The hidden lacing strip was made up of layers of linen “glued” together by using Steam-a-Seam. It worked – to an extent. It wrinkled at the waist (expected) but and kept the front relatively straight. 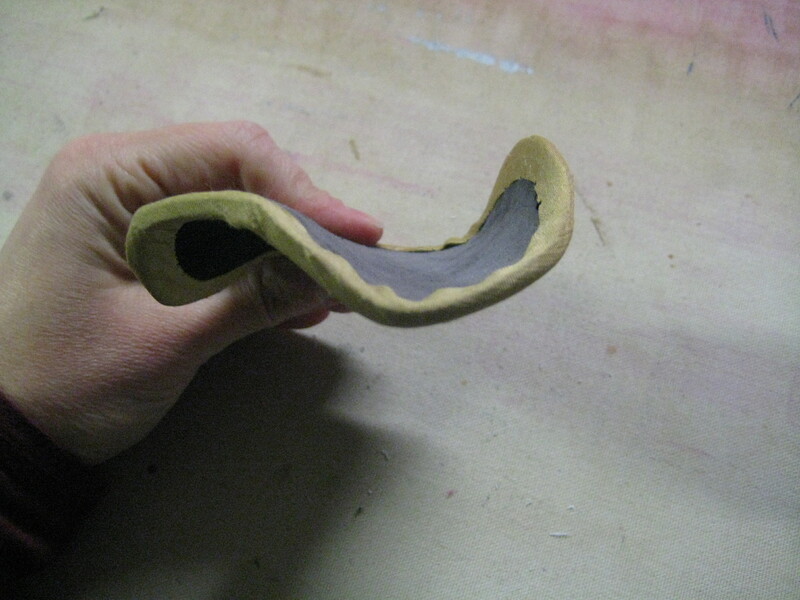 However, I wasn’t totally happy with it as the layers were quite thick in the end. But the idea of gluing layers of linen together makes sense on the entire body area,a at least from beneath the bust through to the hips. However, I’m not sure of the rubber cement – simply because its a bit plasticky. I wonder, if on a human body it could be uncomfortable because of the limited amount of give. I know human bodies where it is in headwear but its not wrapped around a head in the same way it is around a body. Having said that, I have found somewhere a recipe for a paste which may have been used way back in the 15th and 16th centuries – not sure I have the time to use THAT idea this year (new Queen Gown for CoCo Gala), but I am looking at using perhaps basting glue and stitching to see if I could get a similar effect. It really depends on time for me though. Hopefully I can record what I do and write up about it. I love the idea of stiffening the lacing strip with glue- that solves a world of problems. I don’t think I’d use rubber cement on a person either. It doesn’t so much breathe. It’s just the technique I’m familiar with from hat brims, and it struck me when I was looking at source material that those fabulist Tudor bodices just don’t wrinkle- they’re absolutely smooth. That’s sort of hard to do, unless you’re playing some tricks with interfacing. I bought some rubber cement the other day, and I’m going to give this a shot for a project I’m working on. I don’t intend this particular outfit to be an everyday kind of garment, so I’m not too worried about the issues with glue stiffening while worn (this is one of those “proof-of-concept” outfits that require a ton of effort for a possible payoff of nil), but I’m totally curious to see how it works on a human. I’ll take things classes didn’t cover for 100k, Alex…. Best of luck – I only intended to get people thinking about it. How did it work? I am working on clothes for my newly completed Queen Anne doll, and I have gotten a lot of really good ideas from here. The rubber cement will be perfect for the 18th century court gown that I am making for her. I appreciate how you are showing ideas for creating the historically accurate clothes for much smaller figures. I even carved my girl’s waist and torso slightly smaller than the teacher recommended, because I knew that if I put all of the layers on that it would add unwanted bulk, and I was determined to have the right layers. Re-carving the waist is pretty hard-core! I’m impressed. :) I’ve really been enjoying working out patterns with the dolls. They keep you honest, because there’s, like, no margin for error in a 16″ body (especially if it’s vinyl). Do we get to see pics when you’re done? :) That would be super-cool! Did you wait till the contact cement was barely tacky (instead of all snotty) on both sides? Contact cement can be annoying like that. If you can handle the stuff, you could also try a spray adhesive. Be careful – they get onto everything (working in a box is a good idea), and they can cause a pretty amazing rash on some of us.